According to a Business in the Community report, 60% of employees have experienced a mental health problem due to work and 31% have been formally diagnosed with a mental health issue. The cost of poor mental health to the UK economy has been estimated at between £74 - £99 billion per year, according to the report Thriving at Work. Published in October 2017, the report contains the recommendations of the review into workplace mental health, commissioned by the Prime Minister. Recognising the magnitude of the problem and its human cost, the British Safety Council has launched a range of mental health training courses which are designed to start conversations about mental health and support employees who are experiencing mental ill-health. One of the main challenges of dealing with mental ill-health in the workplace is the stigma associated with it, which makes it difficult for people to admit that they are affected. Talking about mental health is one of the ways of addressing this stigma. 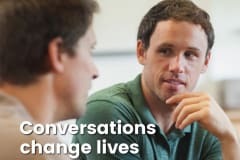 The British Safety Council’s ‘Start the Conversation’ is 45-minute session which aims to get employees thinking about mental wellbeing and talking about it. The next stage is a three-hour ‘Manage the Conversation’ workshop to give line managers the skills and confidence to listen to and talk with someone who needs to share a problem regarding their mental wellbeing. The British Safety Council also offers the two-day Mental Health First Aid course, developed by Mental Health First Aid England, which teaches people how to identify, understand and help someone who may be experiencing a mental health issue. WHY should you learn to talk about mental health? It may save someone’s life: Every week, more than 100 people take their own lives in the UK (source: Mind). It’s in the interest of your company: Mental ill-health expresses itself in poor productivity, increased staff turnover, absenteeism and presenteeism. In 2017, one in ten managers took an average of 12 days off work for mental health reasons (source: CMI). Start the Conversation – a 45-minute session which aims to get employees thinking about mental health and talking about it. Manage the Conversation – a three-hour workshop to give line managers the skills and confidence to listen to and talk with someone who needs to share a problem regarding their mental health. Mental Health First Aid – a two-day course, developed by Mental Health First Aid England, which teaches people to spot the symptoms of common mental health issues and recognise the early signs suggesting that someone may need support. Students can help colleagues with a mental health issue receive the support they need to recover or manage their symptoms. Mike Robinson, Chief Executive of the British Safety Council, said: “Acting on the recommendations of the Stevenson-Farmer review of mental health and using our extensive training expertise, we have developed much needed tools to help people start and manage these difficult conversations about mental health.